Saved by good fortune from the flames that engulfed the first Goetheanum, Rudolf Steiner's wooden sculpture of the Christ - "the Representative of Humanity" - standing between the adversary forces of Lucifer and Ahriman, remains intact, although unfinished, and on display to this day. 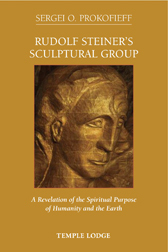 Unique in the history of art, the Sculptural Group was deeply connected to Rudolf Steiner's inner being. The great Christian initiate even died by its side, having made efforts to work on the sculpture days before he crossed the threshold. The essential source from which this work was created, says Sergei Prokofieff, "... lay in Rudolf Steiner's ego, in his spirit... It was only out of this intuitive connection of his own ego with the Christ Being that he was able to create this work of art." Beginning with the Sculptural Group's early history, and Steiner's collaboration on its creation with Edith Maryon, Prokofieff enters into deeply esoteric perspectives, studying the artwork's relationship with the mysteries of the Holy Grail, the etherization of the blood, the Seventh Apocalyptic Seal, the Legend of the New Isis, as well as the being Anthroposophia.